Estimated property tax increases for the new high school project continue to be publicized by the School Building Committee in the media as the "average" over 25 years. 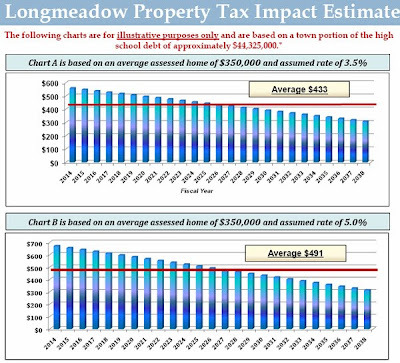 Below is the latest property tax impact analysis by Longmeadow Finance Director, Paul Pasterczyk using the MSBA approved projected building costs and reimbursement information. 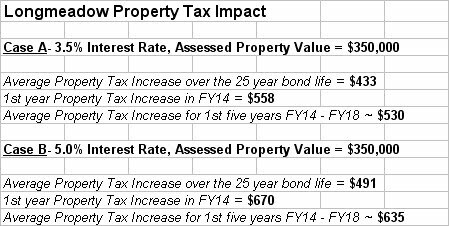 As I have mentioned in previous posts, the frequently quoted "average property tax increase" over 25 years is not reached until the year 2027- halfway through the life of the 25 year bond. For most home owners, the first full year property tax increase (FY14) as well as the first five years property tax increases are probably more important- not the average over 25 years. Below is a summary of key information derived from the above graphs. 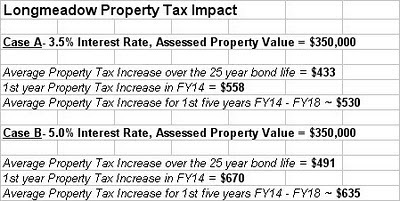 The above table for Chart A shows that the first year (FY14) property tax increase is 29% higher and the 1st 5 year average is 22% higher than the 25 year average. Similar results are found for Chart B results. No one knows what the final taxpayer cost will be for this project because of the uncertainty of both interest rates and project building costs. According to the MSBA approval letter, Longmeadow will be granted up to a maximum of $34 million on a total project cost of $78.5 million. If unforeseen construction costs such as unexpected asbestos removal are incurred that are larger than that included with the budgeted contingencies, it is most likely that Longmeadow would have to cover those costs without reimbursement from the MSBA. At the School Building Public Forum on September 30, I asked Jeffrey Luxemberg of Joslin Lesser & Associates- Owners Project Manager about the impact of unforeseen cost overruns for our high school project. He indicated that such an "overrun is borne by the locality" meaning Longmeadow and that the MSBA will not provide any additional funding. Below is a short video clip of his response. Up to now I have been a supporter of the new Longmeadow HS but during the recent FY11 budget discussions I have become increasingly concerned about our ability to afford this project without future sacrifices of important town services. You cannot separate operational and capital needs- the money to fund both types comes from the same source- the Longmeadow taxpayer. Next year, there will likely be continuing discussions to reduce or close Storrs Library and the Longmeadow Adult Center and other town services in order to meet the every increasing financial needs of our schools. I ask every town resident to make a special effort to become better informed about the school building project by attending upcoming public forums and the special town meeting on May 25. Also, don't forget to learn more about each of the four candidates running for the two seats on the Longmeadow Select Board. The two individuals who are elected will become key players in determining Longmeadow's future. Mark election day- Tuesday, June 8 on your calendar. On Monday afternoon I attended a public forum at the Longmeadow Adult Center organized by a group of concerned citizens including Roger Wojcik, Jerry Nolet, Joe Ochuitti and Phil Fregeau. There were a total about 40 people in attendance representing many different constituencies in town.... including three School Committee members/ the School Building Committee co-chair, two Select Board members, a Select Board candidate, numerous senior citizens, pro-school / anti-school, former teachers, ..
Longmeadow is in a Fiscal Crisis! The cost of our Schools, Public Safety and other Town Services is becoming overwhelming. The School Committee is asking us to take on a $46 million mortgage for a new high school. Longmeadow is obligated to pay $28 million in Other Post Employment Benefits (OPEB) which it does not have. Longmeadow’s buildings, roads and water/sewer systems need over $100 million worth of repairs. Longmeadow’s budget for next year begins to borrow from our last remaining reserve fund. The organizers were asking for ideas on how the town might make its way through this mine field of future expenses. The meeting quickly evolved to a “shouting match” debate over the merits and concerns of the proposed $78 million high school building project. From the prospective of someone who has followed this project and is reasonably knowledgeable about many of the specifics, I found that there was significant misrepresentation and inaccurate information contributed from both sides- particularly with regard to the cost of the new + renovated high school to the average taxpayer. 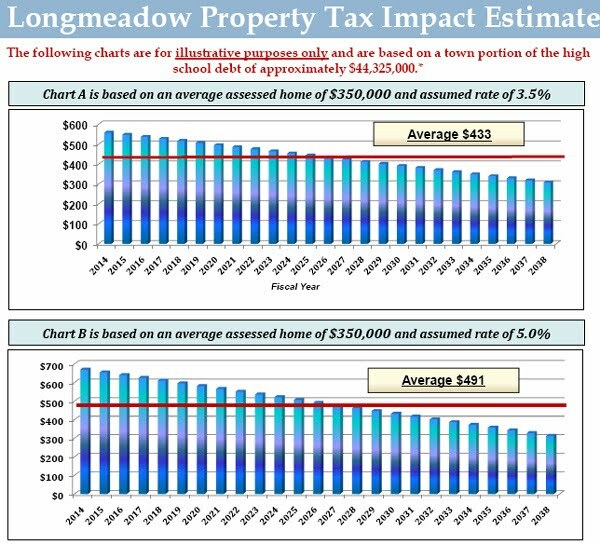 I have commented in past LongmeadowBuzz postings that the School Building Committee's average tax increase estimate was misleading. A recent summary of the taxpayer cost by Paul Pasterczyk- Longmeadow's Finance Director wherein the annual cost is shown for each of the 25 years of the school project bond is a much better representation. The first full year of project impact in FY14 will increase the average taxpayer's cost by $575 - $700 depending upon prevailing bond interest rates at that time. The average annual increase over 25 years is estimated to be $455 - $516. Note: These numbers are somewhat high because the project cost to the town is now $44 million vs. the $46.2 million used for Mr. Pasterczyk's analysis. 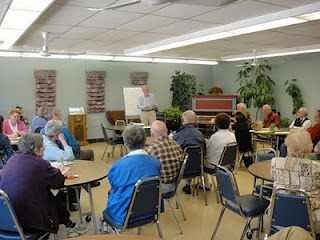 I attended this public forum as an observer and not as a participant. I have attended numerous public forums in the past on similar subjects, listened to my fellow neighbors share their views and occasionally added my own comments. With most past forums, I have walked away feeling that the public debate was worthy of our great town…. Monday, I walked away very disappointed that our town has been much more polarized than I had thought, that the intensity of debate had risen dramatically and many of the participants were not listening to the other side. Most concerning was outright disrespect for other people’s opinions and ideas. I can only hope that this forum is not representative of the debate that will occur between today and election day and that both sides will work together to see our way through the current financial crisis. We need compromise on both sides….. One word that did finally emerge at the end of the forum seemed to suggest what is needed for our town to successfully navigate these difficult times…. BALANCE…. I will expand what this word means in future posts.